“1997. Scarclaw Fell. The body of teenager Tom Jeffries is found at an outward bound centre. Verdict? Misadventure. But not everyone is convinced. And the truth of what happened in the beautiful but eerie fell is locked in the memories of the tight-knit group of friends who embarked on that fateful trip, and the flimsy testimony of those living nearby. 2017. Enter elusive investigative journalist Scott King, whose podcast examinations of complicated cases have rivalled the success of Serial, with his concealed identity making him a cult internet figure. In a series of six interviews, King attempts to work out how the dynamics of a group of idle teenagers conspired with the sinister legends surrounding the fell to result in Jeffries’ mysterious death. And who’s to blame … As every interview unveils a new revelation, you’ll be forced to work out for yourself how Tom Jeffries died, and who is telling the truth. I am absolutely delighted to welcome you to my stop on the Six Stories blog tour which I share with the lovely Inge over at The Belgian Reviewer. I am absolutely delighted because I CANNOT wait to talk to you about this book! To say I’m a fan is a bit of an understatement. Now, Matt Wesolowski is a new author to me but I heard about this book towards the end of last year and instantly knew that I had to read it. Matt’s background is predominantly in the horror genre so I knew this was going to be something special and by golly, it certainly was! Ah, that need to discuss a book you’re loving. I don’t think I’ve done that before. I was thrilled to see a good number of replies from fellow bloggers and reviewers all saying how utterly absorbing and chilling they found this book. I can’t begin to explain what it is about Six Stories that makes it such a sublime read (but I’m going to give it a go anyway!). First off Matt Wesolowski is a master of unease. He creates it and shapes it beautifully. Normal, everyday people going about normal, everyday things…only for something completely unexpected to be added to the mix, something shocking. You never know whether it’s safe to start breathing normally again or whether you should be bracing yourself for the next unexpected twist. It’s almost impossible to know what to believe. The evidence is all laid out before you, so that should be it right? Believe what you want to believe, I can’t tell you what’s right and what’s….well, read Six Stories for yourself and experience the book. You won’t regret it. I absolutely loved the format of this book which is completely different to anything else I have read of late. The ‘witness’ podcasts are fascinating and incredibly easy to read which meant I stormed through this book, despite wanting to make each minute count. I loved the conversational style of the podcasts and was looking for new clues in each statement. I’m not sure I found any but I was certainly looking. In between the podcast chapters are chapters relating to the experience and emotions of Harry Saint Clement-Ramsay who found the decaying corpse of Tom Jeffries one year after his disappearance. Some chapters are in the past and explain why he and his upper class pals were out roaming Scarclaw Fell in the dead of night with dogs and lamps. Others are in the present and detail Harry’s thoughts and feelings since the initial broadcast of the first podcast. I felt these chapters really added to the story and were necessary – giving that extra vital background information. I felt truly scared at points and heartily commend Matt Wesolowski for his use of tension. The plot doesn’t really slow at any point and keeps you teetering on the edge. I couldn’t get enough of this book and I can guarantee that I will read it again in the future (one of those rare books that gets a second read!). Well, that’s if I can forget about Nanna Wrack in the meantime. Creepiness at it’s very best! Would I recommend this book? Six Stories is my current favourite read of the year so far and it’s going to take an awful lot to knock it from it’s top spot. It’s so different, so utterly unique that it deserves to be read by all crime thriller fans (and horror fans too!). You’ll be missing out if you don’t pre-order this book today. Go on, you know you want to. Otherwise Nanna Wrack may pay you a visit…. 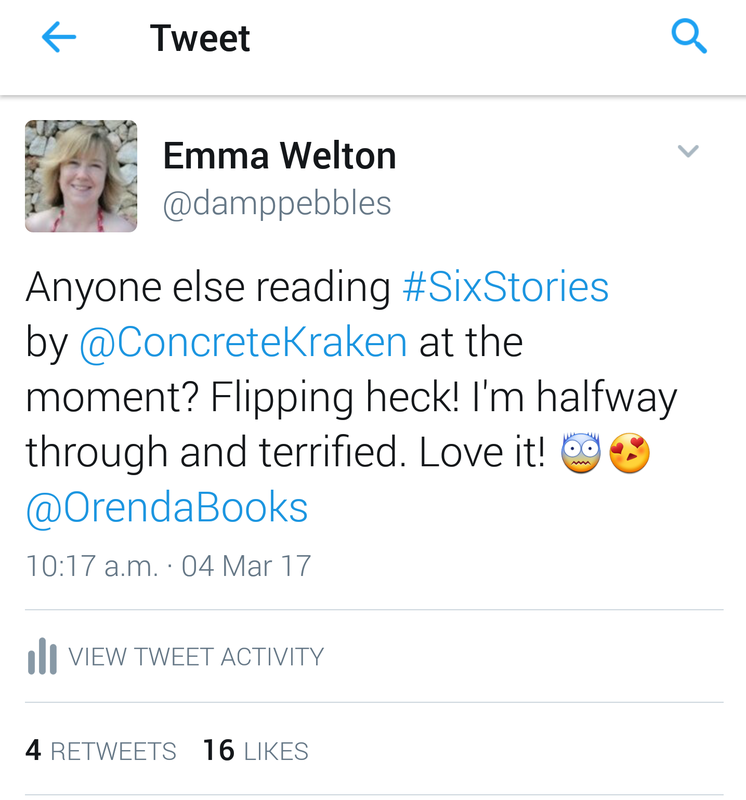 I chose to read and review an ARC of Six Stories. The above review is my own unbiased opinion. Oww thank you for the mention! I didn’t get a notification in my feed so it’s wonderful to be surprised by that. I mentioned you too btw ;-). I’m so happy today is all about how much we love this book.. I knew it was a winner very soon and that ending made it really fantastic. I love how he messes with our minds like that :-). 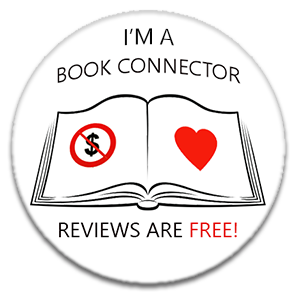 This is my second 5-star crime rating this year so that is telling a lot! Awesome review Emma! Top spot of the year is high praise indeed:) I really enjoyed this one as well and think he’s hit on such a fresh, creative take on the murder mystery.